Austin Healey Bug Eye Sprite, Jaguar XK120 and Lotus Cortina “Going to the Show,” where they will join 500 other classic cars and motorcycles at the annual event at VanDusen Garden in Vancouver. Celebrated Vancouver painter Michael Stockdale was commissioned by the Vancouver ABFM event organizers to paint this year’s official event poster. The artwork entitled Going to the Show measures 12″ x 16″ and uses acrylic paint on stretched canvas. 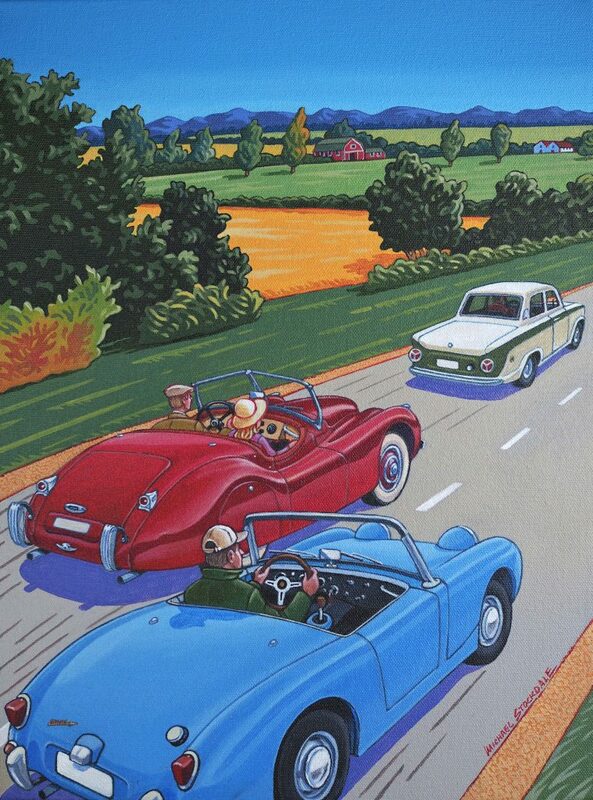 It depicts an Austin Healey Bug Eye Sprite being passed by a Jaguar XK120 with a Lotus Cortina in the distance, while British Columbia’s pastoral Fraser Valley landscape forms the backdrop. 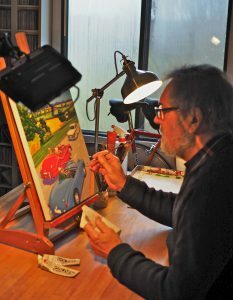 Stockdale is known for his passion for classic cars and love of landscapes, people and the visual story-telling style of his paintings. He will display a variety of his work at this year’s Vancouver ABFM on Saturday May 19, 2018 at the 33rd annual VanDusen event. He will also be available for commissioned works. The original ABFM Going to the Show ‎collectible painting is available for purchase. Interested parties should contact Patrick Stewart pstewart@westerndriver.com. Stockdale can be reached at michaelspaintings@gmail.com.